These are similar to adult birthday parties. I usually will stage a 30-minute magic show followed by walk-around magic or psychic effects for 90 minutes. If the party is at a bar or restaurant and takes on the feel of a cocktail party, then I change it to 120 minutes of walk-around magic. I grab the attention of small groups of people and perform 3 or 4 magic effects for them eliciting applause or shrieks or laughs and then move on to another small group. I have performed for after-prom parties from 1:00am to 4:00am in the morning (more than once). 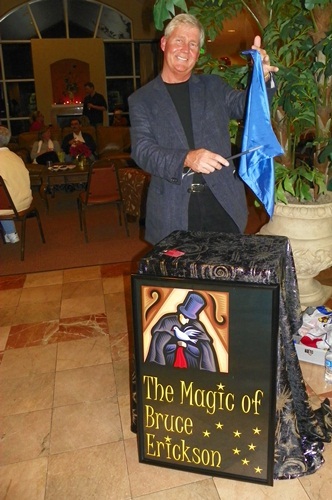 My birthday party magic can be themed for all close-up magic, all psychic/mentalism, or a combination. I love to make the party more memorable and fun using close-up illusions to amaze your guests. My goal is “astonishment.” I have entertained with cards, coins, silks, ropes, mind reading, levitation, and other small miracles. I do not do magic for children under 10. I can refer you to many of my friends who specialize in kids magic. The format is usually an intimate 30-minute magic show followed by 30 to 90 minutes of close-up magic depending on your party.